You will just love our Compressor Piston Assembly, as it is brilliant in working and durability. Our products have been manufactured by using the best raw material from the nature that makes it stiff from its origin. 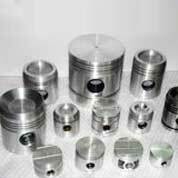 We are glad to proclaim that we are the premium air compressor piston assembly exporters in India. Pressure die casted, gravity die casted, shell moulded pistons are made out of aluminium alloys, graded closed grained cast iron. Piston rings are individually centrifugally casted out of high grade cast iron materials. Russian: 175 mmYork: JS Series.